Friends and Family WEEK – JOIN US! We’re approaching our veteran boot camper BONUS WEEK! We like to open this week up to all our veterans, their friends, and family members. Whether you are participating now, or have in the past – you are invited to our FREE WEEK. Bring your friends and family members and build your support system. Hope to see you there! 1. It increases your participation – less skipped workouts when you know your friend or family member is ready and waiting on you. 2. You work harder – a little friendly competition helps. 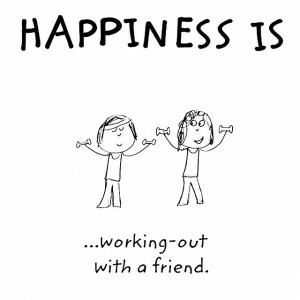 Working out with a faster or stronger friend will push you to do your BEST, eventually becoming faster and stronger yourself. 3. 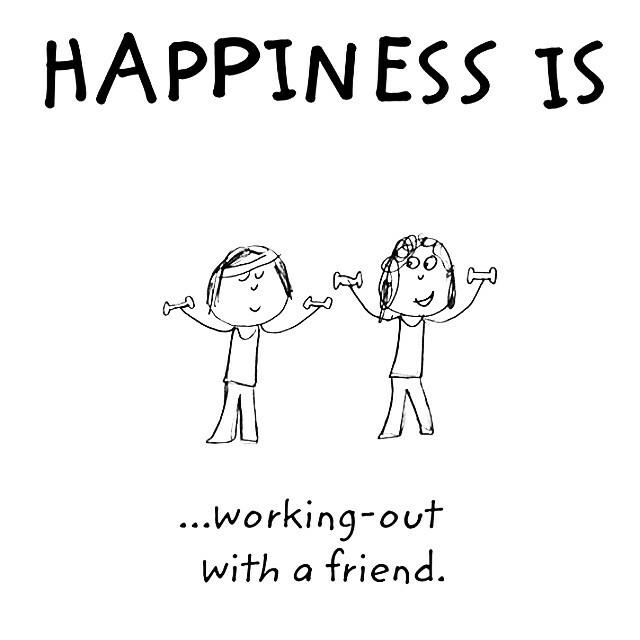 Healthier Happy Hours with Friends – friends who work out together may also have a greater awareness of health in other areas of life. Rather than spoiling all your hard work at an unhealthy happy hour, workout buddies may choose to order more on the healthy side. 4. Easier to try something new! It’s less intimidating to do new workouts and exercises together. Maybe you’ve taken January to ponder your 2016 intentions and NOW you are ready to start living your BEST LIFE! Reposting this one for those starting resolutions in FEBRUARY – or just to keep in mind throughout the year. “This New Year gives us the gift of more than 525,600 minutes. Many of us say we “don’t have enough time”, but for this next year, as with all other ones, we all get the same amount of time- about 525,600 minutes. 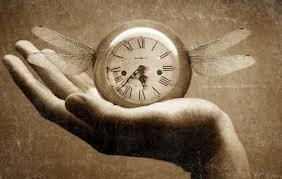 What we do with the gift of these minutes determines the quality of our life, the level of our happiness, the value of the memories we create and the difference we can make in the world. Our lives are determined by how we choose to live our 525,600 minutes each year. Minutes spent stressed or worrying are wasted. Fear not only kills our dreams, it also diminishes our minutes without providing productive results. None of our unused minutes can be saved as “rollover” minutes for the next year. None can be given to others and unused ones will be lost forever. When we look at our minutes from this perspective, it helps us realize the gift we’ve been given. Cherish family and friends. When we look back at a year, the things that usually stand out are times spent with loved ones, and the moments of connection with one another. If you’re not having fun, go do something that IS fun!! !Spend your time doing what you love and what brings joy into your life. Let go of the past. Don’t waste a good minute worrying about a bad one. Know that everything is perfect exactly as it is. Trust that there is a reason, even when you can’t see it. Be positive. Realize you do have a choice, and choose to be positive in your thoughts and your actions. Take baby steps and don’t give up! Keep moving in the right direction.Trust yourself and your abilities. Just because something didn’t yet work out as planned, doesn’t mean it won’t work out. There is always a way and you can’t lose unless you give up. Embrace change. Resisting change is like trying to swim upstream. Instead, embrace it and go with the flow. Connect with Nature. Watch sunsets. Talk to a tree. Listen to the wind. Taste the sweetness of a fresh apple. Study a leaf. Play with a dog. In all things, find your connection to something bigger than you. Love life! Do what you love and love what you do. Happiness comes from spending minutes doing things that bring you joy. Laugh! Relax, be playful and remember, life is meant to be fun! Expand your world. Learn about other cultures, celebrate our differences and find common ground. Create a vision. Write down 100 things you want to accomplish this year and share it with someone you love. Create a vision board to keep your dream alive! Dream BIG! Dream big dreams and trust that you’re on the right path to make them happen. You deserve the very best in life- claim it! Listen to your inner voice. Many times, wisdom comes to us in silence. Spread kindness. Connect with one another. Share a smile. Perform random acts of kindness. Choose love. Be love. In all things, love now. Exercise your mind and your body. We only grow old when we’re stagnant. Move and grow. Pause. Breathe. Take time for yourself. Know that you matter and remember, you must first fill your own cup before you can give to others. Pass it on. Give. Share. Give away things you don’t need. Share love and resources with others, remembering that blessing flows more easily through a stream without a dam. Pay attention to serendipity. Live connected to something greater than yourself. Open unto and into the possibility of life. Live with faith and hope as a part of your life instead of apart from them. Be grateful. No matter where you are, express gratitude, knowing that what you focus on grows. If you’re going to create more of something, let it be gratitude. Be conscious of your thoughts. Know that your thoughts hold the power to create tomorrow’s reality. So think good thoughts. Dream big dreams. Celebrate the moments of your life. Be YOU! You are so very beautiful; so let your light shine. You are an unlimited being with infinite potential. You have no limitations except those that you place on yourself. Leaders in Weekend Fitness Fun! 1. Provide an opportunity to get extra movement in on the weekends. 2. Promote community spirit and connections within and outside the group. 3. 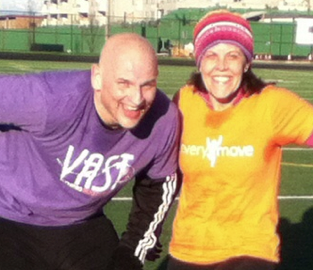 Encourage the first-timers to participate and experience the joy of group fitness. 4. Explore and enjoy all the beautiful parks, trails, and running paths in the Seattle area. Robin Gibsonis a group fitness enthusiast and regular participant with Vast Fitness. She holds the official title of “ VP of Enthusiasm” on the Sweaty Betties MeetUp page and is one of the organizers. Along with Vast Fitness vet, Damon Jones, Robin organizes and leads “Betties and Buddies” events on weekends. Although Robin grew up in San Diego, CA (where it is sunny all the time! ), she has felt a strong connection to Seattle from the moment she arrived. She loves the trees and being outside in the fresh air, starting her day with an early workout and laugh with her buddies. Robin is a mother of two, has a PhD in Biochemistry and works at the University of Washington as a Research Scientist. When she is not organizing or participating in outdoor boot camps or trail runs, she enjoys listening to audiobooks while commuting on her bike, hiking, swimming and dancing to zydeco and blues. Congratulations Kelsey! I’m happy to announce that Kelsey just completed her ACE fitness certification. After three years of participating and fine tuning her own fitness in Vast Fitness boot camp, Kelsey decided to obtain her Group Fitness Instructor certification so that she could have the opportunity to challenge and support others in their own fitness and health journeys. Kelsey began her love of fitness in her late teens when she starting distance running, lifting weights and taking fitness classes to lose weight (big weight, ask her some time). She is passionate about living an active life, focusing on what you can do, striving for moderation and living to be your best self. 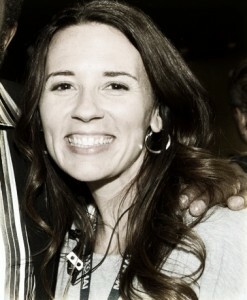 Kelsey is a scientist by training and received a PhD in Medicinal Chemistry from the University of Washington in 2011. She currently works on amyloid diseases at a small biopharmaceutical company. On the weekends, you can find her on a trail run or urban hike in one of the many Seattle parks or cooking up a new and healthy recipe. Join Kelsey this spring and summer to be inspired and pushed beyond what you believe you are capable. We are extremely happy to add a consistent yoga practice to our weekly boot camp classes. Tara’s style of yoga hits all the right spots and has us feeling refreshed, both mind and body. After a decade of practice, Tara was drawn to teaching yoga in order to share her passion with others. A graduate of the 8 Limbs Yoga Centers Teacher Training Program, her classes are rooted in the strong belief that yoga offers something for everyone: tranquility, stability, flexibility, strength, focus, bliss – all and more are available with dedication and practice. 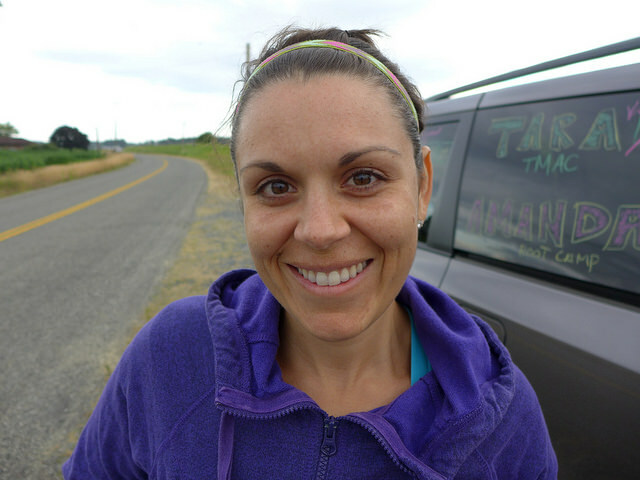 Tara has a lighthearted, playful teaching style, with mindfulness towards alignment and anatomical awareness. When not on her mat, Tara works for a local museum, goes for walks with her dog, or has her nose in a book. Join Tara and the gang on Tuesdays at 6am!